Wendy Barbour is a recent addition to San Diego Previews Real Estate. She brings with her an impressive San Diego real estate resume and extensive knowledge of San Diego’s urban and beach living. She is passionate about San Diego real estate and homes, and chose to write her first article here about the statement fine gates can make about a residence, whether in the country, in suburbia or protecting the entry of an Oceanside urban row home. I have always been fascinated with gates. They serve as protection for a home, they create architectural interest, and are an investment that can yield impressive returns. Take a meandering drive through Rancho Santa Fe, and you will see impressive iron and/or wood gates that protect an entire estate. These are generally situated at the street entry to the driveway and are electronically con trolled. The beauty of these gated Rancho Santa Fe estates starts at the point of entry with gated elegance. Prices for driveway gates such as these can range from $900 for a small custom walk-through gate , or $12,000 to $85,000 for a grander drive-through gate or to the Strato$phere for the likes of Bill Gates or Google founders. But you don’t have to have protected acreage in Rancho Santa Fe to make use of beautiful gates. 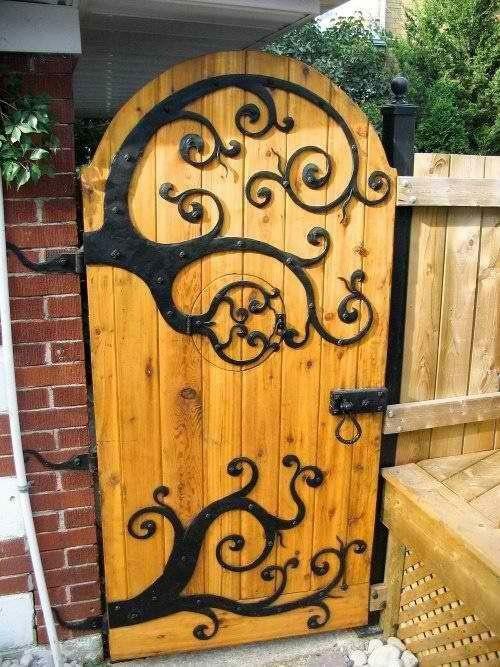 Drive through almost any San Diego neighborhood, and you will see fine examples of custom gates. Even builders of new homes are now adding gated interest with some of their models. Some of the gates are small, and might serve to keep a homebound chihuahua away from the street, while others are more imposing. The old adage about not getting a second chance to make a first impression certainly holds true with the gate that guards your home! gates are beautiful indeed. i think the spanish countries have the finest. here in vancouver, canada we are a young city , less than 150 years old, so little of that ole world stuff but lots of natural geographical beauty. You are probably right about Spanish and Mediterranean gates. San Diego, fortunately, has many Spanish and Mediterranean inspired homes that lend themselves well to ornate gates. Hope all is well in lovely Vancouver!